Size: approx. 310mm x 360mm. 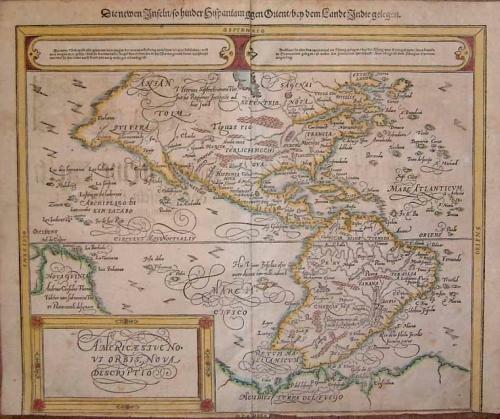 Munster's woodcut map of the Americas. South America has the bulge that is characteristic of this period. Also the great Southern continent is present. A calligraphic title is within the ornamental border with German black letter text. The map has been trimmed to the lower margin with a small loss to the printed border. It has two very small pinholes and a very small tear to the lower border. Despite these minor flaws the condition is good for such an old map.